Who invented Penicillin? The name of the person credited with inventing Penicillin is Alexander Fleming (1881 - 1955). Alexander Fleming is not only famous as the Scottish inventor of Penicillin but also as a biologist, bacteriologist, pharmacologist and botanist. When was Penicillin invented? Alexander Fleming invented Penicillin in 1928, during the Interwar period of invention (1918 - 1939). The invention of Penicillin originated in Scotland is considered a paramount achievement in the field of Medicine. Definition of Penicillin: Penicillin is defined as an antibiotic drug made from fungus and molds or produced synthetically, used to prevent and treat various infections and diseases caused by a wide variety of bacteria. Fact 1: Who invented Penicillin? Penicillin was invented by Alexander Fleming in 1928 during the Interwar Era of inventions (1918 - 1939) which was a tremendous addition to advancements made in the area of Medicine. Fact 2: Who invented Penicillin? Prior to the discovery of Penicillin in 1928, there were no drugs to treat infections caused by bacteria such as pneumonia, respiratory tract infections, ear infections, urinary tract infections and skin infections. The invention of Penicillin saved millions of lives. Fact 3: Who invented Penicillin? The inventor of Penicillin, Alexander Fleming, was born on August 6, 1881 in Darvel, East Ayrshire, Scotland, UK and died on March 11, 1955. Fact 4: Who invented Penicillin? The early years of Alexander Fleming were spent at Lochfield farm in Darvel, East Ayrshire, Scotland, UK where he was raised by his father Hugh Fleming and his mother Grace Sirling Monton together with the family of four children. Alexander Fleming was educated at Loudoun Moor School, the Darvel School, and the Kimarnock Academy. Fact 5: Who invented Penicillin? Following his early education his first job was in 1900 as a Private in the London Scottish Regiment. Then in 1903 Alexander Fleming enrolled in St. Mary's Hospital Medical School in Paddington. Fact 6: Who invented Penicillin? Following his graduation Alexander Fleming joined the research department at St. Mary's to work as a temporary assistant bacteriologist to Sir Almroth Wright (1861 - 1947) a pioneer in vaccine therapy and immunology. Fact 7: Who invented Penicillin? 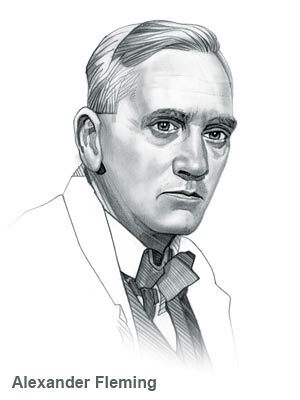 Alexander Fleming had every intention of becoming a surgeon but Sir Almroth Wright's revolutionary ideas of vaccine therapy inspired him to enter the field of Bacteriology. Bacteriology is the branch of medical science that studies bacteria in relation to disease. Fact 8: Who invented Penicillin? WW1 (1914 - 1918) erupted and Alexander Fleming served in the Royal Army Medical Corps. The terrible wound infections suffered by so many soldiers were commonly treated with antiseptics but Fleming soon realized that the antiseptics were doing more harm than good due to their diminishing effects on the body's immunity agents. Fact 9: Who invented Penicillin? More soldiers were dying from their treatment than from the infections and bacteria than the antiseptics were trying to destroy. Infected wounds also led to amputations because the antiseptics did not work. Alexander Fleming recommended that treatment using antiseptics should be replaced simply by keeping the infected wounds clean, but his advice was largely ignored. Fact 10: Who invented Penicillin? During the Great War Alexander Fleming he took leave from working in the battlefield hospitals of Boulogne, France and married Nurse Sarah Marion McElroy of Ireland on December 23, 1915. The couple had one son they named Robert. Fact 11: Who invented Penicillin? After the war, Alexander Fleming returned to St. Mary's and focused his researchon anti-bacterial agents after witnessing so many amputations and deaths from infection during the war. Fact 12: Who invented Penicillin? In 1921 Alexander Fleming discovered and proved the natural antiseptic power of the enzyme he called 'lysozyme'. Fleming found that the substance lysozyme was present in the tissues and secretions of the body, and was capable of rapidly dissolving certain bacteria. Fact 13: Who invented Penicillin? Encouraged by the discovery of lysozyme Alexander Fleming continued his research into identifying other anti-bacterial agents. In August 1928 he left his lab and went on holiday with his wife and young son. Before leaving, he had stacked all his cultures of staphylococci (staph infections) on a bench in a corner of his laboratory. Staph bacteria can cause a wide range of infections of the skin, blood, lungs and heart. Fact 14: Who invented Penicillin? On returning from his vacation Fleming noticed that one culture of staphylococci was contaminated with a fungus, and that the Staph bacteria immediately surrounding the fungus had been destroyed. It was September 28, 1928 and Alexander Fleming had accidentally discovered the world's first antibiotic. Fact 15: Who invented Penicillin? The mold he accidentally developed created a bacteria-free circle around itself - he first called it 'mold juice' but on March 7, 1929 renamed it "penicillin" from the Latin penicillus meaning "paintbrush" in reference to the shape of the mould cells. His discovery of penicillin was published in the British Journal of Experimental Pathology but his findings were largely ignored. Fact 16: Who invented Penicillin? In 1940, a team based at at the Radcliffe Infirmary in Oxford, which included Howard Florey, Ernst Chain and Norman Heatley, continue Fleming's research and were successful in purifying penicillin. The team also developed a way to mass produce penicillin which aroused the interest of Pharmaceutical companies. The commercial production of penicillin as an antibiotic began. Fact 17: Who invented Penicillin? The invention of Penicillin was recognized as a great advance in medicine and in 1943 Alexander Fleming was elected Fellow of the Royal Society and knighted in 1944. Fact 18: Who invented Penicillin? In 1945 Sir Alexander Fleming together with Howard Florey and Ernst Chain were awarded the Nobel Prize in Medicine. Fact 19: Who invented Penicillin? Sir Alexander Fleming became famous but his fame was overshadowed by the death of his wife Sarah in 1949 after 34 years of marriage. Fact 20: Who invented Penicillin? In 1953, Sir Alexander Fleming found happiness again when he married Greek research assistant at St. Mary's, Dr. Amalia Voureka Coutsouris. Fact 21: Who invented Penicillin? Sir Alexander Fleming died on March 11, 1955 of a heart attack. He was buried in the crypt at St Paul's Cathedral in London. His epitaph reads "Sir Alexander Fleming discoverer of penicillin whose ashes rest beneath this plaque".